When choosing a leafy green vegetable, most people immediately select the more popular vegetable, spinach. Swiss Chard, however, has grown in popularity, offers a tremendous nutritious value, and is delicious raw or cooked! I had the opportunity to visit several local gardens during my summer stay in Northeast Harbor, Maine. Every garden was highlighted with red, yellow and white stalks of Swiss Chard. 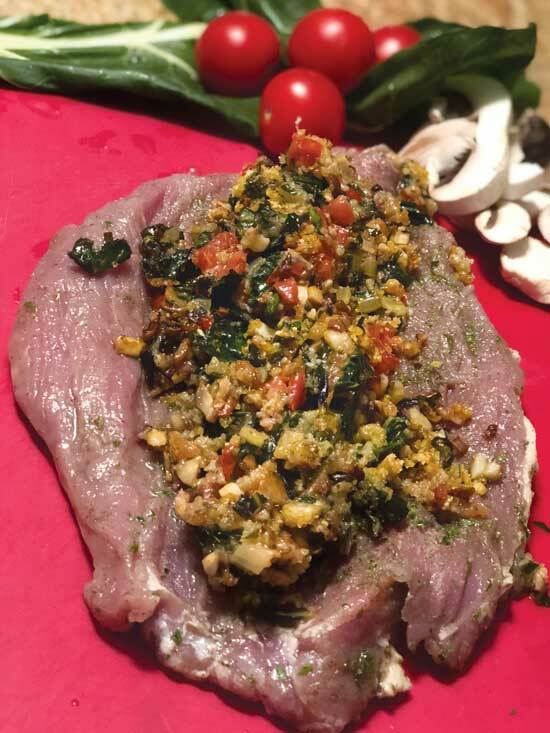 Pairing vegetables and proteins that provide maximum flavor was my goal when I created my Swiss Chard Stuffed Grilled Pork Tenderloin. This new recipe is similar to my Stuffed Calamari recipe. First, it pairs a lean protein and highly nutritious vegetables, but most importantly it compliments the ElectriChef Grill. Secondly, since this recipe requires you first to sear the meat, then to slowly cook the lean protein it is essential to have precise control over the grill’s temperature. I am able to preheat my grill and steam my side dishes, then once the grill is at maximum temperature I’m able to sear the exterior of my stuffed grilled pork tenderloin. Then I reduce the heat (with the touch of a button) to create a perfect internal temperature, leaving the final product moist and full of flavor. I provided a few tips in this recipe that can be very helpful in maintaining the maximum flavor and ease of grilling on your ElectriChef Grill. One of my upcoming blogs will focus on ElectriChef Grilling Tips for your electric grill. 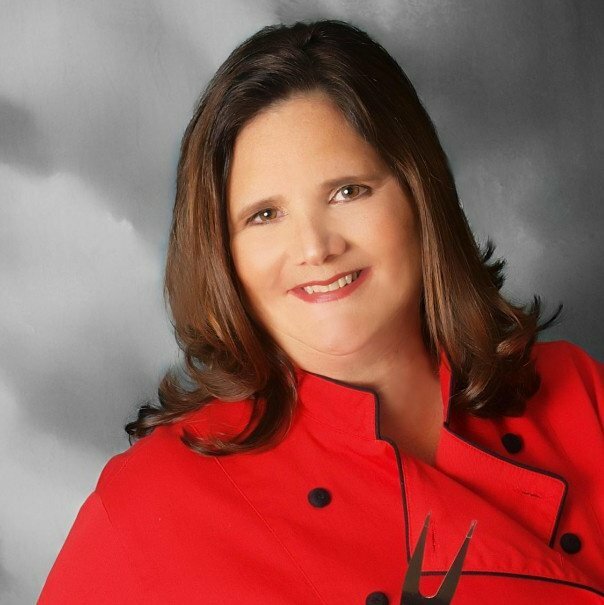 If there is anything you would like to know, please email me at chefpaulette@electrichef.com. 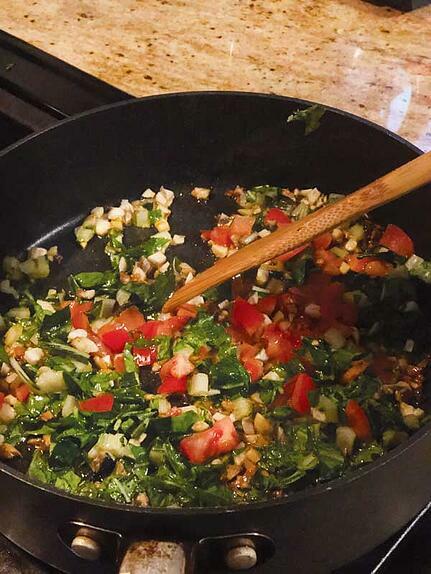 Add the Swiss Chard, tomato, and garlic and sauté until tender about 8 minutes. Add the parsley and cook 1 additional minute, folding parsley into the mixture. Remove from the heat and set aside. Soak toothpicks in water to prevent them from burning on the grill. Rinse the pork and pat dry. Chef Tip: How to butterfly a Pork Tenderloin: Using a sharp knife begin slicing the tenderloin down the length of the tenderloin closest to the cutting board, about 1/4 of the thickness of the tenderloin. Remember you are trying to create an equal thickness through the whole tenderloin. Be careful you do not cut all the way through, stop with about 1/2 inch to go on the tenderloin. Begin to repeat slicing the tenderloin, you will see the tenderloin begin to “roll open” and create a flat piece of meat, almost like a thin filet. For a visual sense, imagine you are cutting a “C” in the tenderloin and rolling it out flat on the cutting board! The whole tenderloin should now be about a 1/4 inch thick and is ready to be lightly pounded with a meat mallet and stuffed. Spread the Swiss Chard mixture over the tenderloin. Starting with the longer side of the tenderloin, roll tightly roll making sure Chard stuffing stays inside. Secure the seams with the toothpicks on a diagonal. Chef Tip: Remember to count how many toothpicks you use so they can be removed before serving! Spray your ElectriChef grill grates with Canola oil then preheat your ElectriChef Grill to 600°F. 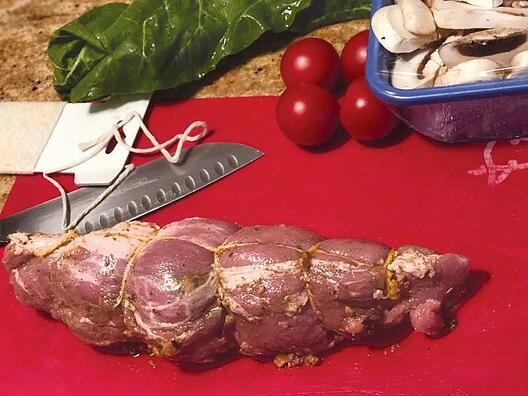 Brush the tenderloin with lemon juice, remaining olive oil and season with salt and pepper. Sear the exterior of the tenderloin for 12 minutes, turning to each side every 4 minutes. Reduce the temperature of the grill to 450°F and continue grilling turning at least one to ensure even grilling. 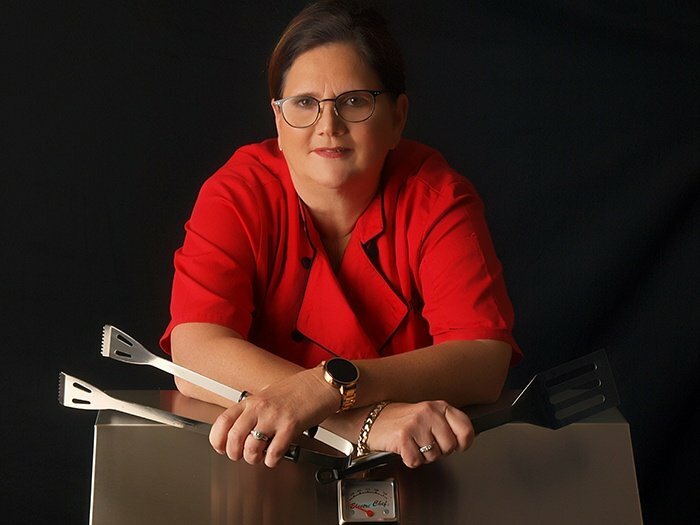 After an additional 15 - 20 minutes of grilling, use a thermometer to check the internal temperature by inserting a thermometer into the center of the tenderloin, when it reads 140°F, remove from grill using tongs. Chef Tip: Always use tongs when handling proteins instead of using a fork. 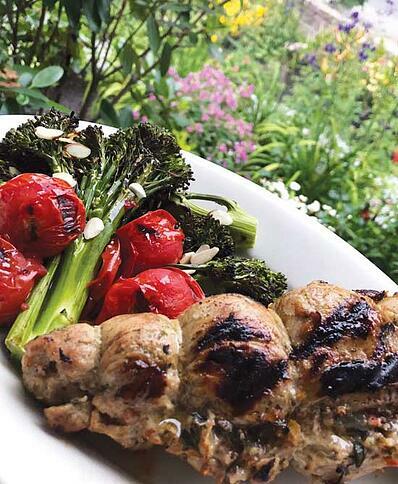 Puncturing proteins before and after grilling can cause natural juices to be minimized. Transfer tenderloin to a cutting board to rest, about 5-8 minutes. Remove and count toothpicks, slice, sprinkle with lemon zest and transfer tenderloin to a serving platter. 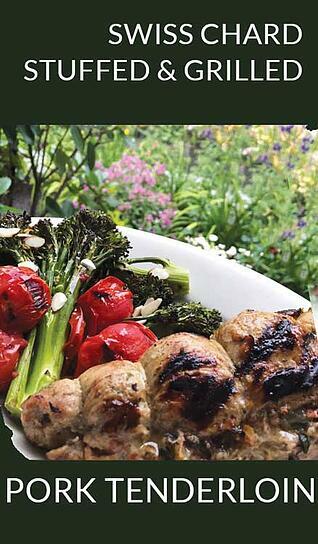 Chef Tip: I grilled broccolini and tomatoes as my vegetable. 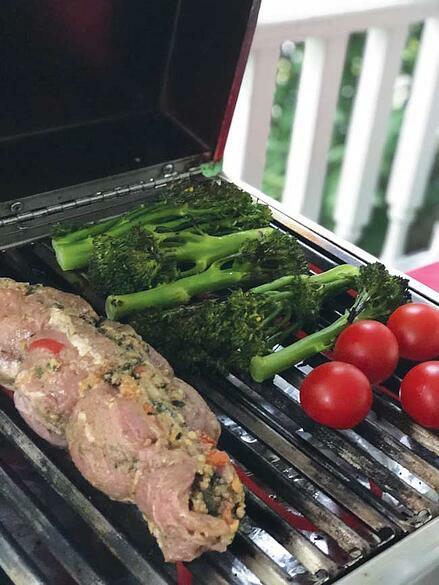 When you preheat your ElectriChef grill, put the tomatoes and broccolini on the grill and pour 1 cup of water into the drip tray. When grill is preheating vegetables will steam and partially cook. When you are 15 minutes into grilling tenderloin, add vegetables back on the grill. Drizzle with olive oil, salt, pepper, and any remaining lemon zest! Everything will be finished at the same time. 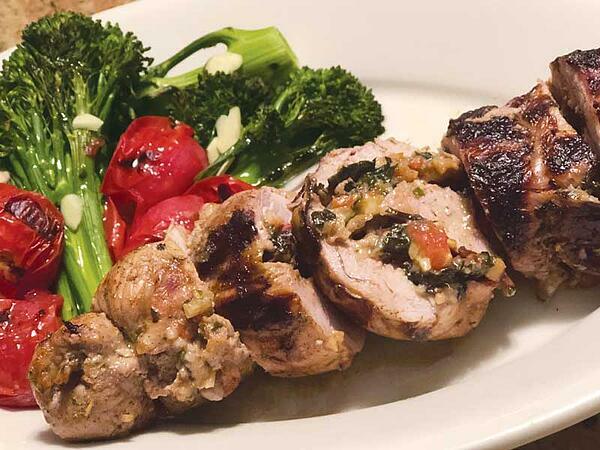 Now it is time to enjoy your swiss chard stuffed grilled pork tenderloin! Feel free to leave a comment or reach out and let us know what you think of this recipe and others.